This is quite an interesting place,” England cricket team captain Heather Knight had told reporters after visiting the sanctuary. 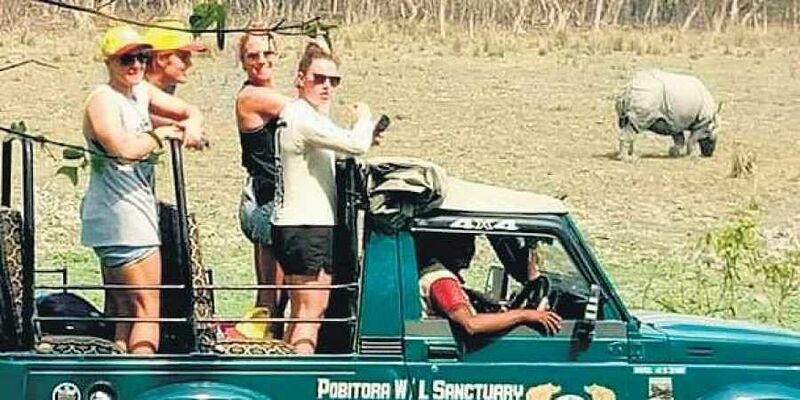 Famous for one-horned rhinos, the Pobitora Wildlife Sanctuary had members of the English women’s cricket team mesmerised when they visited it during their stay in the city for a three-match T-20 contest against India. The team visited, Pobitora, also known as the Mini Kaziranga, and praised the management of the sanctuary for their efforts. “We are very happy to be here. This is quite an interesting place,” England cricket team captain Heather Knight had told reporters after visiting the sanctuary. There seems to be no letup in human-leopard conflicts in picturesque Guwahati. The latest incident was reported from the city’s Maligaon area. A couple was injured when a leopard strayed into their home. The animal was caught and tranquilised after several hours of efforts by forest department officials. About 20 hills are spread around Guwahati. These are home to leopards who often stray into the city. Deforestation due to encroachment is increasingly shrinking the forest land, leaving no space for the leopards. The first North East Skill Centre (NESC) was set up recently by the state’s BJP-led government in collaboration with Singapore-based ITE Education Services. The basic aim of the NESC is to provide skills training to unemployed youngsters of the state. It will offer year-long diploma courses in beauty and wellness, retail services, food and beverages and housekeeping. Chief Minister Sarbananda Sonowal said the government’s effort is aimed at tapping the talent of the young.